On the back of reading a very interesting and slightly hitting post (read it here) written by my friend Martyn, it got me thinking about the posts topic 'its OK for men to talk too'. Across the various media channels from time to time you see posts written about various forms of the writers feelings and levels of depression, but I've hardly ever seen these posts written by men. I'm not saying that there aren't any out there just that to me there very rare. Surely the men of this world have times in their lives where they feel low and alone, feel like they have no one to talk to, they can't talk to friends, family members or even their own partners because they may see it as a sign of weakness or perhaps they feel others will 'take the piss' for talking about feelings or something like that. I can honestly say I have been there, I wouldn't say I was depressed by any means I would just say it was a very low and lonely dark place I was in at the time. We were going through a rocky patch in our marriage and I began to fall into a dark place so much so that at times I felt like I was wearing a mask. Yes a mask, a happy smiling mask at that, one that showed my kids 'daddy was happy and OK' and one that answered my wifes questions of 'are you OK, you don't seem yourself' with yes dear all is OK, even though it wasn't. Thankfully though with a few good friends and many hours of talking I came through my darkness, yes looking back now I possibly did possibly burden them with my problems and troubles too much some would say and to that I send them a massive thank you for pulling me through. So back to post, yes it's important to talk, whoever you are male or female it's good to talk, Martyn'sas they say a problem shared is a problem halved. Join Sooty and his friends for fun, laughter and learning in this direct to DVD special. Join Sooty, Sweep, Soo and Richard in their Alphabet Adventure, a perfect way to introduce little ones to the alphabet. This special direct-to-DVD programme, produced by Redan Publishing’s Fun To Learn brand, Tvoli Entertainment and Abbey Home Media who are also distributing the title, features all the fun, mayhem and slapstick capers fans have come to know and love from Sooty and his pals, while engaging children and helping them develop early literacy skills. Sooty remains one of Britain’s best loved children’s characters, and this special episode, which sees the gang visit Wookey Hole, near Wells in Somerset, for a letter learning adventure, is sure to appeal to his fans everywhere. Studies show that children respond well to early education programmes when presented in a fun way, and featuring familiar favourite characters. Sooty ABC – Learn the Alphabet DVD supports the Early Years Curriculum and Sooty, Sweep, Soo and Richard are all on hand to take young viewers all the way from ‘A is for Apple’ to ‘Z is for Zoo’, with lots of laugh out loud comedy and humour along the way. Now it's your turn to win your very own copy of this fabulous DVD, my kids loved it you can read all about it here. Sooty the yellow bear, everyone at some time in their lifetime has been entertained by this lovable yellow bear since he and Harry Corbett first appeared as regulars on the BBC children's show Saturday Special all the way back in 1952. I remember growing up watching Sooty, Sweep and Soo living in their little bedroom having many happy hours of fun with their co-star Matthew Corbett. 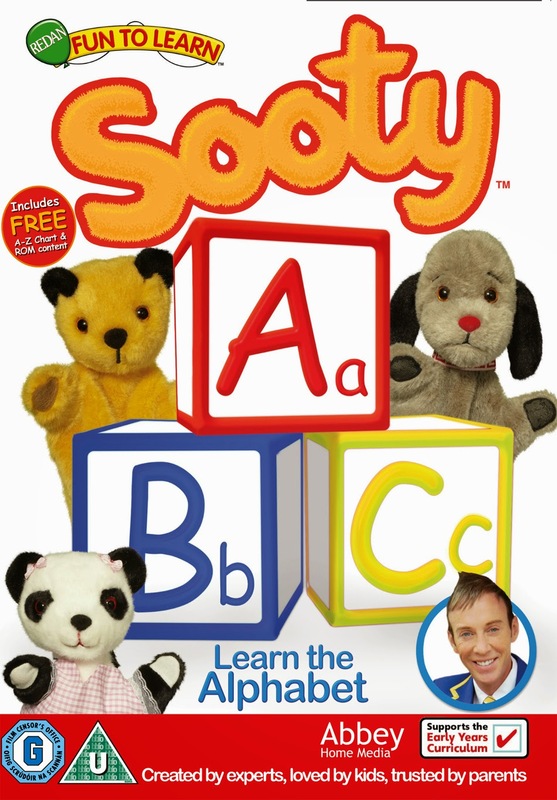 So when I was approached to see if I would be interested in reviewing Sooty ABC - Learn the Alphabet DVD obviously I jumped at the chance, not only for me to relive some of my childhood memories but more importantly to help my children learn their ABC's. In this special direct to DVD programme we see Richard, Sooty, Sweep and Soo visit Wookey Hole in Somerset and during their visit they find items that reflect letters of the alphabet like Q for Queen, G for gorilla and S for stick. During this DVD there are many laugh out loud moments with the various jokes mixed in amongst the searching for the letters of the alphabet. My children loved watching this DVD so what I decided to do was entail a bit of our own learning by pausing the DVD at various points to see if my children could spot any items that corresponded with the letters of the alphabet before the gang pointed then out on the screen, my children loved doing this and cheered every time they got the item right. This DVD also contains three classic episodes, The Swimming Lesson, The Farm and The Beach and also includes printable worksheets to enhance the learning experience. This would make a great Birthday present or with Easter only round the corner maybe a little Easter present which in turn will help and support your little ones through the early years curriculum. This special DVD goes on sale Monday 2nd March. At the time of this review this DVD was on sale on Amazon to pre-order for £7.25, I believe this price is reasonable for a educational DVD. If you fancy winning your very own copy of the fabulous DVD head on over to my GIVEAWAY post now. You can follow Sooty on facebook too. I was sent these review DVD for review purpose only and all views and opinions are my own. Today I decided once the children had eaten breakfast we'd have a none TV morning. At first the children didn't find this such a popular decision to be honest but once they realised this was how it was going to be they just got on and played. They decided at first they'd play with their chuggington set, so we made some different sets. 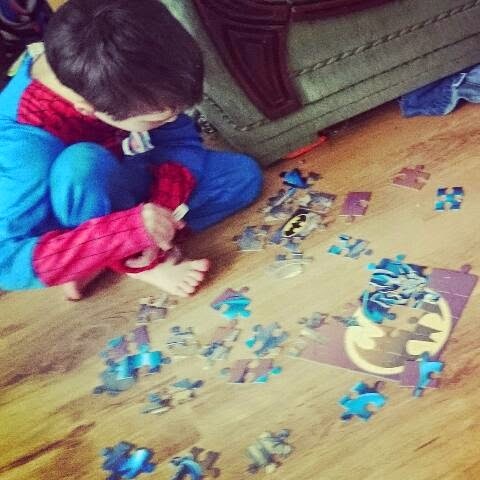 Then they decided they wanted to play with their new jigsaws, which to be honest kept them quiet for a fair amount of time as they decided to turn it into a competition to see who could complete theirs first. To finish the morning session off before lunch they decided to play shop, well their version of shops anyhows, they transformed their spiderman house into a shop and used their moshi monsters and their shopkins as customers and items on sale. They all had their little moments like most children do but to be fair it was a fun happy morning. My little princess L-A is at that age where the simplest of things make her laugh and be happy. Like when we take and pick up her brother's from school, she loves walking up the road to and from school, she will all of a sudden start laughing and giggling at various things. She will try and jump over puddles that are on the path, when she splashes in the edges of the puddles she will just laugh her head off. I will walk along the street holding her little hand and say for example jump L-A, skip L-A come on L-A lets run and she will attempt to follow the instructions whilst laughing her little head off. I must admit it is lovely to hear her walking along and laughing at the simplest of things like running up the street. At home we have wooden living room flooring, she loves pushing her dolly round the living room in its pushchair especially without any shoes on as she slides along whilst pushing the pushchair, every now and then she will slip over and bounce on her bum she will look round to see if anyone is looking then she will just laugh and get up and start again which is well cute to be honest. The other day we went shopping just me, mummy TP and L-A, whilst mummy was clothes shopping with TP me and L-A went food shopping. We whizzed around the isles and I pretended to be a speeding car which L-A found really funny to say the least, especially when daddy started spinning round the corners of every isle but the other customers didn't find it funny oh well lol. I am really enjoying L-A being at this age of laughter and care free fun because I know it won't last and soon it will become "daddy can I have", " daddy I'm staying out till ...." "Daddy I want that new phone" lol. You've all either been there and done that or have it all to come like my wife and I lol. F Is For ...... Freddo Faces. Back in December last year we took the children to Cadbury World, whilst there we had a tour of the factory and along the way was this picture board opportunity so obviously the boys and mummy had to stop to pose lol. 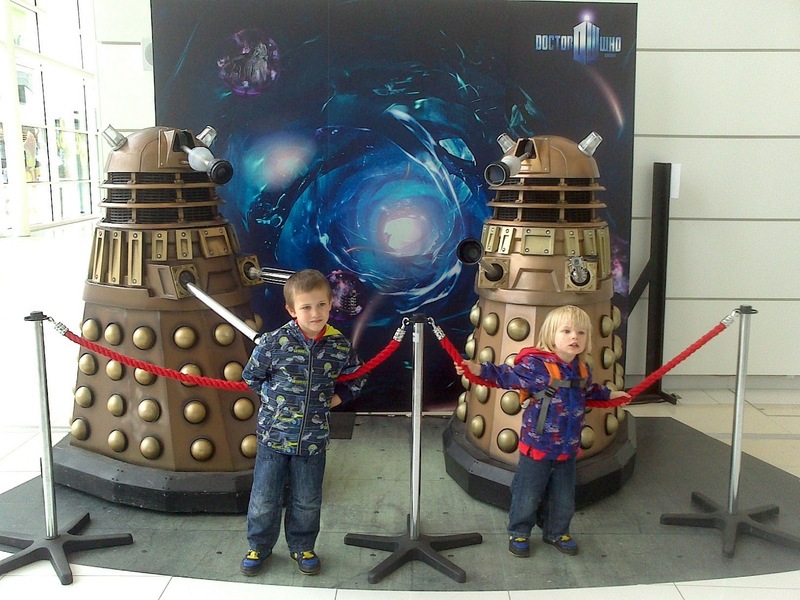 E Is For ...... EXTERMINATE. D Is For ...... Dennis the Menace. Before Christmas my wife, children and I were invited to our local Brewers Fayre pub for the national launch of their Beano Themed children's menu and play area. The children really enjoyed themselves and they even got their photo took with the legend himself.